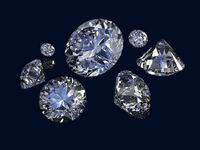 Perfect Diamond has a constant and reliable supply of premium cut, loose wholesale diamonds. The beauty of a diamond is not simply in great colour and clarity; It is the overall cut-grade, that consists of the cut, symmetry and the final polish of the stone. These factors are what bring out the sparkle of your perfect diamond. At Perfect Diamond, we provide only the highest level of cut stones, enabling you to sell flawlessly cut diamonds to your customers with complete confidence. Perfect Diamond provides a wide range of certified wholesale diamonds in a variety of carats, cuts, colours, shapes and clarity; including a large variety of loose wholesale Hearts and Arrows Diamonds. Perfect Diamond offers a comprehensive diamond education section to ensure customers find the perfect diamond for their needs, whether it be flawless clarity, a dazzling cut or a perfect shape. At Perfect Diamond we pride ourselves on flawless service. As a way of further developing this service, we now offer our full range of certified wholesale diamonds through our online diamond inventory. Join us today and become part of the Perfect Diamond family.